APKGrabber is an application for Google's Android operating system to update installed applications without using Google Play. The application is a fork of APKUpdater which we reviewed in 2017, twice. APKUpdater development stopped in 2017 and the new app takes over making sure that it is fully compatible with new Android devices and operating system versions. There are two core reasons why someone would want to use an application like APKGrabber, and both have to do with Google Play. The first reason is that some Android users don't want Google Play on their devices because of privacy reasons. The second that they may update applications that are not on Google Play, or install versions of apps that are not yet available on Google Play. APKGrabber looks and functions pretty much like APKUpdater. The application displays the list of installed apps on start, each with its name and version. A tap on the scan button runs a scan for updates. The application scans third-party hosts like APK Mirror for updates and displays all updates that it finds in the updates tab in the interface. APK Mirror is the default source but you may add Google Play, APK Pure, or Uptodown to the list of sources in the application settings. The current and new versions are displayed for each app, and you may either ignore an update or hit the source button to open it in a browser to download the updated APK file to your device to install it. The app does not update applications that you select automatically. While that is less comfortable, it does give you more control over the updating process. New users may want to go through the options on first start; you may change update scan parameters, disable self-update checks, or enable Wi-Fi only checking there. 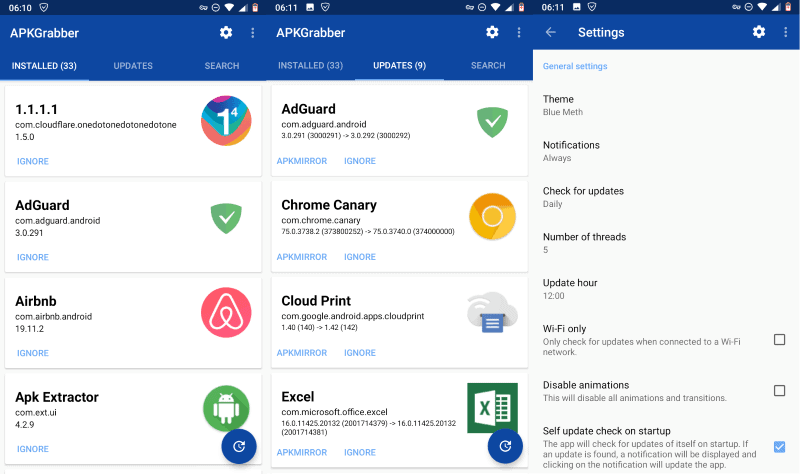 APKGrabber is a useful application for Android users who don't want to use Google Play, cannot use it, or want application updates to reach their devices faster or at all. There is a risk in downloading apps from third-party sources, but the same is true for apps that are distributed through Google Play as the past has shown. Very useful tool for update my old smartwatches without Google account that I use as security house cam. I can’t find the apk to download on the landing page (on GitHub) – am I supposed to compile it myself from source? Just select the Releases tab there, it is a bit hidden. Yalp Store is an another opensource application that has similar functionality to this app. I update manually using my data bundle rather than wifi. It’s the only way to prevent Samsung installing even more junk on my phone. They still send me prompts to install the latest ‘new features’ and I have to choose “Not now” or “Later” every time, but at least it allows me to control what gets installed and what doesn’t. I’m one of those who doesn’t use Play. I do use F-Droid and, for a couple of things, the Amazon app store. Both of those come with their own alternatives to the Play app. I also manually download, install, and update a number of apps. This looks like a more convenient alternative to doing that. I’ll check it out. Thanks! Hey this is awesome! They type of stuff that keeps me reading ghacks. BTW, have you considered integrating Disqus commenting? I’m a big fan. Very useful. Sick of having to sign in to a forced (unused and unwanted) gmail account created purely to get apps on my android. I have found various sites on the web to download without this silly named repository but having a viable alternative is long overdue. I go to f-droid but these app(lications) may turn useful, sometimes. Sorry I’m bit confused here, I think the title is misleading.